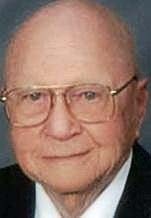 W. Louis Beecher, 90, of Waterloo, died Monday, April 30, 2012, at Cedar Valley Hospice Home. Born on Sept. 17, 1921, in Cerro Gordo County, Louis was the son of John and Luella Beecher. Upon graduation from Immaculate Conception High School in Elma, Louis enrolled at Loras College at the age of 16. He continued his education at the University of Iowa, receiving his Bachelor of Arts degree in May 1942. Louis married Gertrude Murray on Nov. 17, 1943, at St. Joseph’s Catholic Church, New Hampton. She preceded him in death Jan. 27, 2007. Louis served in the U.S. Army Air Corps from May 1942 through June 1946. He was a flight instructor at Perrin Field, Texas, before being assigned as a pilot and captain in the Troop Carrier Command with service in Africa, Egypt, Iran, India, Burma, China, Manchuria and French Indochina. Louis received the Air Medal for meritorious flight on Dec. 8, 1945, over the North China Sea. He remained in the U. S. Air Corps Reserve until 1959, retiring with the rank of captain. At the end of World War II, Louis re-entered the Iowa College of Law and received his Juris Doctorate degree with distinction in 1947. He entered the practice of law with his late uncle, W.L. Beecher, and had practiced law continuously in Waterloo since June 1947. He was senior partner in the Beecher Law Firm. Mr. Beecher was deeply committed to the growth and vitality of the Cedar Valley and enjoyed many years of involvement in civic and business expansion projects. Louis provided legal counsel for several hallmark Waterloo business projects, including the establishment of Black Hawk Broadcasting Co. and local NBC TV affiliate KWWL, the R.J. McElroy Trust, the expansion of the John Deere Waterloo Operations at East Donald Street, KBBG Radio, Waterloo Municipal Airport and numerous other local and regional business, civic and recreational initiatives. Louis served as chairman of the board: National Bank of Waterloo, St. Francis Hospital, Trustee Iowa College Foundation and Wartburg College and Director of A.Y. McDonald Manufacturing Co. He also was past president of the Waterloo Industrial Development Association and the Waterloo Chamber of Commerce. Louis was humbled to receive many honors during his lifetime, including the Junior Achievement Business Hall of Fame Award, Cedar Valley Alliance and Chamber Legacy Award, The Courier Eight Over 80 Award and the Honorary Doctorate of Letters and Humanities from Allen Hospital School of Nursing. He and Gertrude were also inducted into the Columbus High School Hall of Fame. He was a member of the Black Hawk County Bar Association, Iowa State Bar Association, the Waterloo Elks Club and St. Edward Catholic Church. Louis Beecher was a deeply patriotic man, with great respect and admiration for the country and communities he served throughout his life. Louis also was a warm and gracious gentleman, enjoying time spent with his family and many dear friends, business and legal associates. Louis had a lifelong love of flying and aviation and humbly shared his many enriching stories of life as a young U.S. Air Corps captain flying transport aircraft in World War II. Those closest to Louis will also remember his fondness for restoring antique cars and the pleasure of a good cigar. Although Louis will be remembered for his incomparable contributions to the betterment of Waterloo and the Cedar Valley over the past 50 years, he also will be fondly missed by his many clients, associates and friends with whom he felt fortunate to have shared his long and blessed life. Louis is survived by three sons, J. Michael Beecher (Donna) of West Des Moines, William L. Beecher (Desa) of Tacoma, Wash., and Thomas G. Beecher of Chandler, Ariz.; two daughters, Elizabeth Beecher Petersen (Robert) and Mary Beecher Petersen (Eric), both of Waterloo. He is also survived by his grandchildren, Robert and Katherine Petersen and Cal and Annie Petersen, all of Waterloo, Meghan Beecher of Scottsdale, Ariz, Jennifer and Benjamin Beecher of Tacoma, Todd Ensz of Phoenix and Melanie Kimball of Centerville, S.D. ; one great-grandchild, Emma Murray Kimball; his sisters, Ronnie Riley and LuAnn Hutchins, both of Charles City, and Mary Jane Richmond of Paynesville, Minn.; and brother Bernard Beecher of Waterloo. Louis was preceded in death by his wife, Gertrude; parents John and Luella Beecher; and brothers Gerald and Edward. A Mass of Christian Burial will be at 10:30 a.m. Saturday, May 5, at St. Edward Catholic Church, 1423 Kimball Ave., Waterloo, with burial in Mount Olivet Cemetery, where full military rites will be conducted by Waterloo AMVETS Post 19, Evansdale AMVETS Post 31 and the Iowa Army Honor Guard. Visitation from 3 to 8 p.m. Friday, May 4, at St. Edward Catholic Church, with a 7 p.m. vigil. Hagarty-Waychoff-Grarup Funeral Service on West Ridgeway is in charge of arrangements. Donations in memory of Louis may be directed to R.J. McElroy Trust, 425 Cedar St., Suite 312, Waterloo, IA 50701; the Iowa College Foundation, 505 Fifth Ave., Suite 1034, Des Moines, IA 50309; WDC Cedar Valley SportsPlex, P.O. Box 88, Waterloo, IA 50704, or a charity of your choice. www.people-finders.ws shows him as William Louis Beecher.